William Wordsworth’s poem is called Home at Grasmere. In the poem he writes about his home and the people he shares it with. As children, William and his sister Dorothy were separated when their parents died and William went off to school and then to Cambridge. As adults they were delighted to find each other again and determined to live together. When they moved to Grasmere in 1800 they set up home for the first time, although they lived together all their lives, even after William married his childhood friend, Mary Hutchinson. Dorothy became "Aunt Dorothy" and often looked after the children as they grew up. Of fragrance independent of the wind . . .
(MS B, Reading Text, lines 109-113). During the first two years they lived at Dove Cottage, Dorothy kept a diary, recording people, places and events from the family’s daily life. Wordsworth sometimes used Dorothy’s descriptions as the basis for poems. 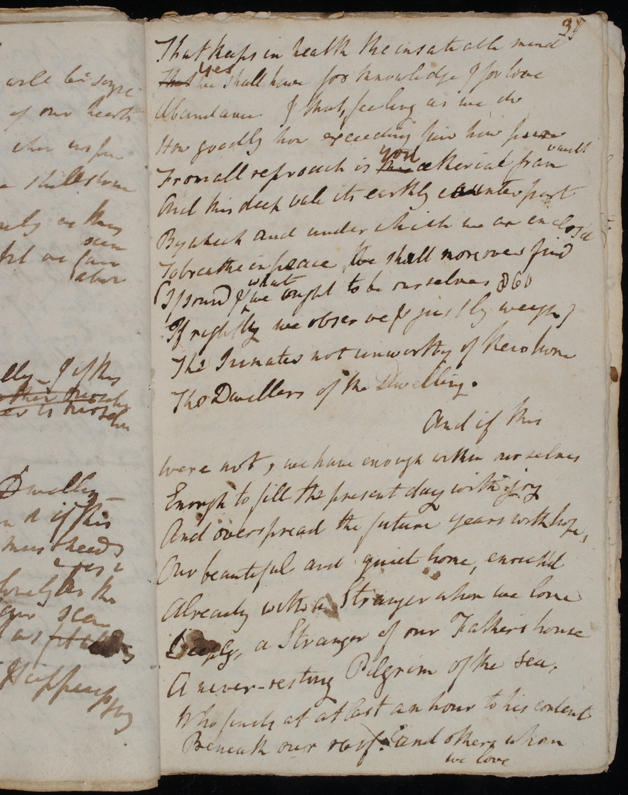 Below is a second extract about William and Dorothy's life in Grasmere and their feelings for other friends and family, followed by these lines on the manuscript page of MS B. Click on the link at the bottom to find out whom Wordsworth is writing about. Samuel Taylor Coleridge was a close friend of William Wordsworth and was also a poet. 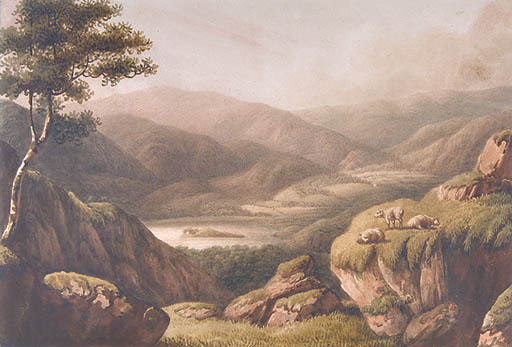 In the following year, after William and Dorothy had settled in the Lakes he followed them there and lived in Keswick, frequently walking across to them to visit. 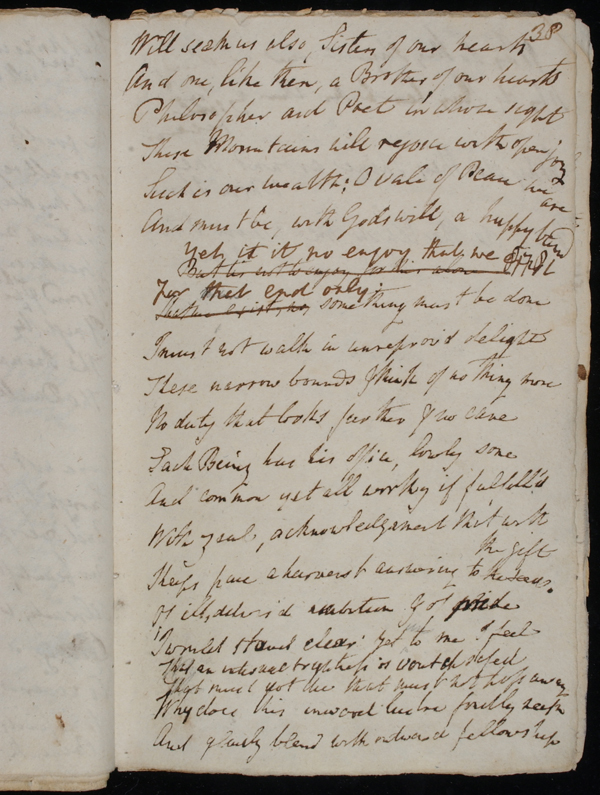 This letter to Coleridge is the first that William wrote after he moved into Dove Cottage. It describes the house and him and Dorothy in it. Read it and then look at the questions below. D is now sitting by me racked with the tooth-ache. This is a grievous misfortune as she has so much work for her needle among the bedcurtains &c that she is absolutely buried in it. We have both caught troublesome colds in our new and almost empty house, but we hope to make it a comfortable dwelling. Our first two days were days of fear as one of the rooms upstairs smoked like a furnace, we have since learned that it is uninhabitable as a sitting room on this account; the other room however which is fortunately the one we intended for our living room promises uncommonly well; that is, the chimney draws perfectly, and does not even smoke at the first lighting of the fire. In particular winds most likely we shall have puffs of inconvenience, but this I believe will be found a curable evil, by means of devils as they are called and other beneficent agents which we shall station at the top of the chimney if their services should be required. D is much pleased with the house and appurtenances the orchard especially; in imagination she has already built a seat with a summer shed on the highest platform in this our little domestic slip of mountain. The spot commands a view over the roof of our house, of the lake, the church, helm cragg, and two thirds of the vale. We mean also to enclose the two or three yards of ground between us and the road, this for the sake of a few flowers, and because it will make it more our own. Besides, am I fanciful when I would not extend the obligation of gratitude to insensate things? May not a man have a salutary pleasure in doing something gratuitously for the sake of his house, as for an individual to which he owes so much. The manners of the neighbouring cottagers have far exceeded our expectations; They seem little adulterated; indeed as far as we have seen not at all. The people we have uniformly found kind-hearted frank and manly, prompt to serve without servility. This is but an experience of four days, but we have had dealings with persons of various occupations, and have had no reason whatever to complain. We do not think it will be necessary for us to keep a servant. We have agreed to give a woman who lives in one of the adjoining cottages two shillings a week for attending two or three hours a day to light the fires wash dishes &c &c In addition to this she is to have her victuals every Saturday when she will be employed in scouring, and to have her victuals likewise on other days if we should have visitors and she is wanted more than usual. We could have had this attendance for eighteen pence a week but we added the sixpence for the sake of the poor woman, who is made happy by it. The weather since our arrival has been a keen frost, one morning two thirds of the lake were covered with ice which continued all the day but to our great surprize the next morning, though there was no intermission of the frost had entirely disappeared. The ice had been so thin that the wind had broken it up, and most likely driven it to the outlet of the lake. Rydale is covered with ice, clear as polished steel, I have procured a pair of skates and tomorrow mean to give my body to the wind, –not however without reasonable caution. We are looking for John every day; it will be a pity, if he should come, that D. is so much engaged, she has scarcely been out since our arrival; one evening I tempted her forth; the planet Jupiter was on the top of the hugest of the Rydale mountains, but I had reason to repent of having seduced her from her work as she returned with a raging tooth-ache. - What problems did they have when they first moved into their new home? - What do they like about it? - What do they think of their neighbours? - Name three things that they required for daily living that we would not need. Why is this? How are our lives different from theirs? Now think about your own home and the people who live there. - What makes a house a home? - What different kinds of home can you think of? - How would home in 1800 be different from a home today? What "home comforts" would you miss? - Why does having a home matter to us so much? Can you write a poem, or a short passage about what your home means to you? Here are a few lines and phrases from Wordsworth’s poem that you might like to use for inspiration. You might also want to use some of the extracts from the letters and journals. "Dear Valley, having in thy face a smile"
"Bright and solemn was the sky"
"a home within a home"
"the Dwellers of the Dwelling"